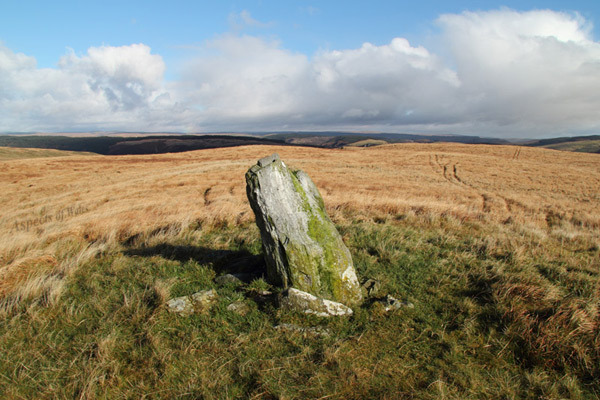 This standing stone is on the top of Mynydd Mallaen in the southern part of the Cambrian Mountains, approx.10km north of Llandovery, Carmarthenshire, at NGR SN7356144682. This can be reached via a very pleasant walk from the forestry trails at Cwm-y-Rhaeadr, near Rhandir-Mwyn. This photo was taken around mid-day in early November 2012. Canon EOS 600D, Canon EF-S 17-85mm lens at 17mm, Manfrotto tripod. Exposure F11 at 1/60 sec. Original image in Raw format.